The Duchess Rowena Swarovski necklace features a beaded clover design with three light-catching dangling crystal drops. 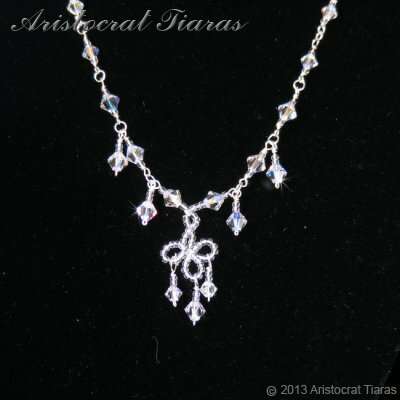 There are two additional crystal drops on either side of the necklace and crystal linkages to add to the sparkle effect. This handmade necklace from Aristocrat Tiaras is part of our bridal jewelry collection for brides designed to compliment our bridal tiaras such as Princess Carmina tiara.